I have been listening to The Bedlam in Goliath nonstop for the past couple weeks. It is one of those cds that is so unique, that even though I’ve listened to it 20 or 30 times, I find something new to like after each listen. This also might be the cd that recaptures people that were put off by Frances The Mute and Amputechture. The songs are much more accessible this time around, with more of a rock element than their previous two releases. 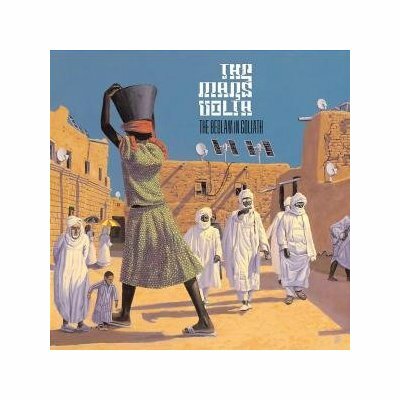 I first got into The Mars Volta after hearing “The Widow” off of Frances the Mute, and I thought that song was great. I never listened to any of their music after that other than on the radio, and decided to buy The Bedlam in Goliath after listening to the samples on iTunes. Man am I glad I did. The best songs are “Goliath”, “Metatron”, “Ilyene”, “Wax Simulacra”, “Ouroborous”, and “Conjugal Burns”. Really though, there isn’t one bad song on this album. I recommend this to anyone who is a fan of bands that like to push music in unique ways. All these guys are fantastic musicians, and although they don’t have the most accessible song structure, their creativity is so strong on each song that it just makes for a truly enjoyable listening experience. This album was my introduction to The Mars Volta, and I have since bought their previous 3 full length LPs. Although I’ve heard their singles before, they don’t really show the complexity and talent this band exhibits. Sure their music can be self indulgent at times, but it doesn’t matter when 90% of it is absolutely mesmerizing. This CD is slightly behind De-Loused In The Comatorium, as my favorite The Mars Volta CD. Pick it up if you are interested in a band that plays music unlike anything you’ve heard before.